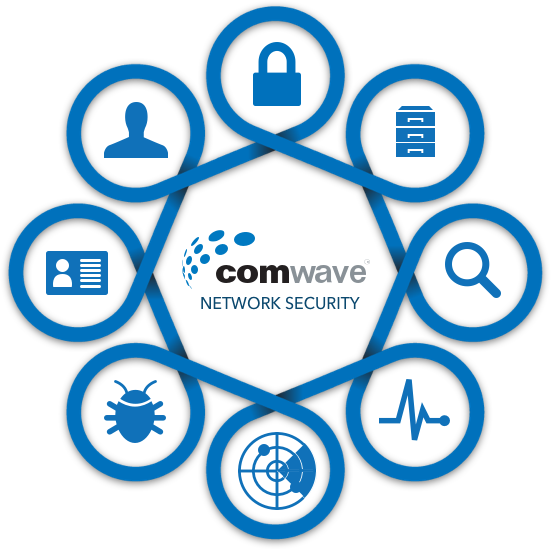 Comwave offers enterprise-grade network security to protect your organization from intrusions, malware, and viruses, while at the same time our cloud based controls allow you to fine tune the level of security, control applications and web filtering. We call it Universal Threat Management (UTM). Leveraging many years of expertise in managing customer firewalls, Comwave works with you to understand your business’ unique security requirements in order to design the right solution. Encompassing design, configuration, deployment, monitoring and support, we provide comprehensive security for branch locations and head offices on a Managed Network, and in our Enterprise Cloud. Enterprise customers demand the very best security. Comwave UTM is built on the Fortinet platform right inside our core network thus delivering “clean traffic” to your organization. This solution has achieved top ranking in Gartner’s Magic Quadrant along with NSS Labs recommending our solution for data centre, enterprise, or branch business with 5x the Next Gen performance of other leading appliances for the greater control and protection of your organization. Because its cloud-based, there is no appliance to manage, maintain or upgrade. Comwave UTM is always fully maintained, up to date and protecting your company. Comwave UTM is built on Fortinet, the #1 market share leader in UTM with over 100,000 deployments per quarter. Fortinet has been validated by NSS labs, AV Comparative, Virus Bulletin and more. The Fortinet global operations centers continually update threats which are fed into the Comwave core for real-time protection without your intervention. While Comwave will use best-practices for protecting your business, our Simple web-based interface allows you to manage and fine-tune your protection. Comwave’s UTM Controller is the heart of the solution in that this is where you control the level of security. You can opt for standard global restrictions to adult content, social media, and video, but also fine tune for greater granularity. No hardware to purchase, support, or manage. Simple web interface to customize filtering and protection. Comwave’s UTM Analytics is an essential add-on to our Unified Threat Management service. Powered by FortiAnalyzer, it securely aggregates network logging, analytics, and reporting into a single system, delivering increased knowledge of security events throughout your network. With visibility to risks, threats, bandwidth consumers, application and web usage, you have the information needed to optimize the UTM policies that protect your organization and mitigate any vulnerabilities identified.